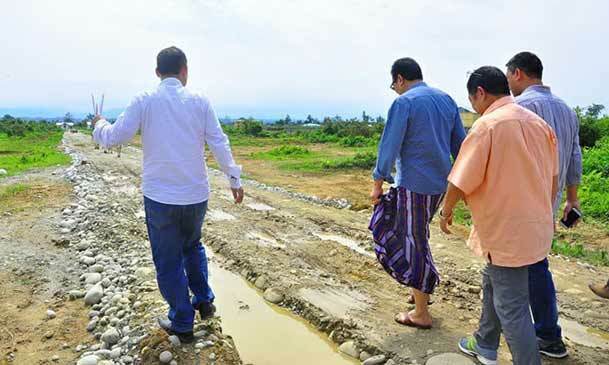 Deputy Chief Minister Chowna Mein on Monday visited the sites of ongoing development projects in various locations of Namsai district of Arunachal, and directed the executing agencies to ensure timely completion of the projects. Accompanied by Planning Parliamentary Secretary Zingnu Namchoom, Mein inspected the construction work for the multi-sports building, the multipurpose cultural hall, the officers’ residential complex, and the bridge over the Jengthu river. He also inspected the internal road constructed in the area. Mein asked the executing agencies to expedite the construction activities while maintaining quality. He also directed them to undertake beautification and landscaping activities in the premises. Among others, Namsai ADC Bijay Talukdar, Tezu PWD SE R Tabin, and Namsai PWD EE CS Namchoom also accompanied the Dy CM.